Imagine having an artwork on your wall that was made specifically for you; an artwork that you’ve influenced and that will enrich your everyday life. It is always an honour to create a unique artwork for someone. The process is personal and exciting, so is the result. Imagine having artwork specifically made for your business/office/reception/waiting room that will enrich the environment for everyone entering your premises. Give me a call to discuss your wishes and let me help you make your space unique, professional and welcoming. “After many months contemplating Art for the blank space in our dining room and visiting many galleries and searching the net we decided that the best solution was to have an artist create something unique for us to suit the space. 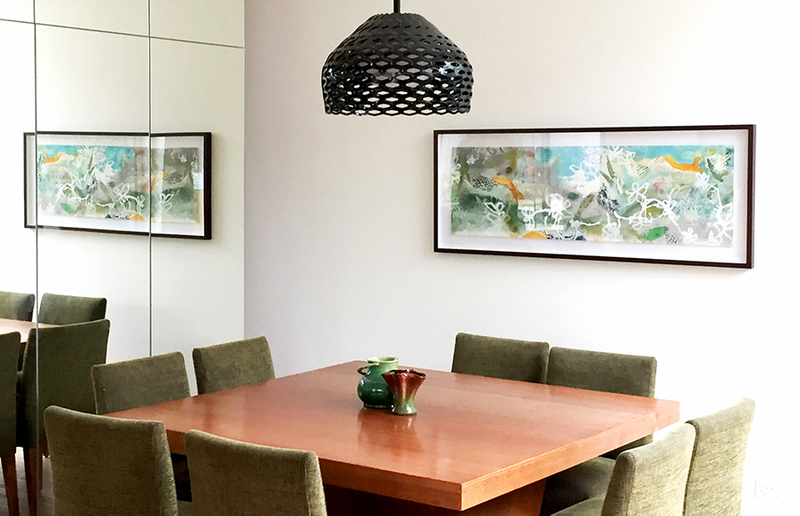 Gitte was recommended to us by our trusted Interior Designer (Jane Brown) to complete a commissioned piece of art. The whole process was very simple. We had a look at the gittebackhausen.art website to make sure we liked her style and then contacted Gitte via skype for a chat about colours, things we liked and a description of the house. It was very easy for Gitte to view our dining area with Skype to get a general idea of the space and the style of our house and furnishings. We also sent photos of the room and adjoining courtyard area and rear garden. We gave measurements of the size of art required and discussed framing too. We were pleasantly surprised to find out that the cost of creating the art was very reasonable. Gitte is very professional and friendly and at the end of the conversation we were convinced that she would create something special that we would really like. Then Gitte set to work. Within a few weeks the mixed media artwork was ready on time as promised. Gitte delivered the art and the result was fabulous. I was evident that she had put a lot of thought into the detail and had cleverly drawn in elements of our garden. Sally & Scott, Lilyfield NSW.